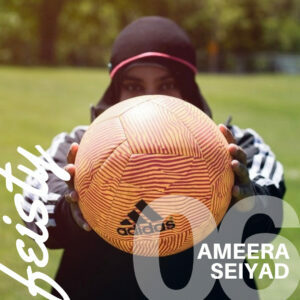 Hi, my name is Ameera Seiyad. 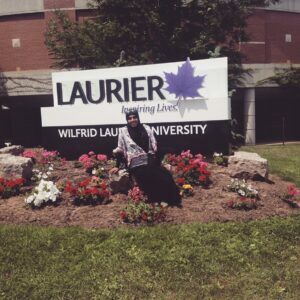 I am 21 and currently finishing my final semester at Laurier. I grew up playing a multitude of sports at various levels, but I stuck to soccer for the most part. 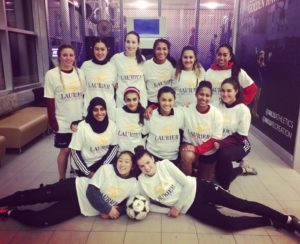 I started playing soccer when I was 5 and now being 21, I still continue to play competitive intramurals at Laurier! Sticking to my faith, having a strong support system and working hard in life are the reasons for my happiness and success so far! When I was 9 I got a chance to play rep soccer for free! You see, growing up in a low- income, high priority neighborhood definitely had its down falls. Playing sports was expensive, so I usually took advantage of the free programs my community had to offer and of course, at school. Besides financial barriers, I also had cultural barriers to overcome. Being a young Muslim girl playing sports in a hijab wasn’t the “ideal” image yet my parents always supported me 100% no matter what the neighbors and other family members had to say. 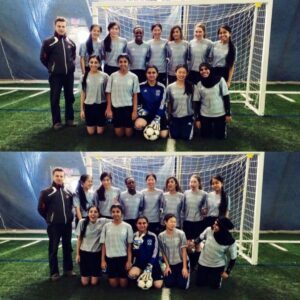 Over time I have gained the courage to overcome the cultural stigma, which let me play soccer with all my heart and I was actually good! What skills did you develop in sport that helped you overcome your barrier? 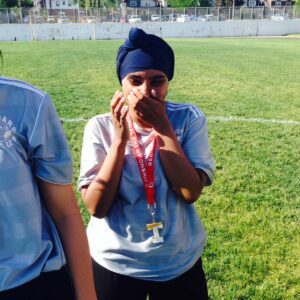 Playing sports with a hijab on as a young girl in a very cultural community definitely helped shape me into the person I am today. I gained confidence and courage to so what I love to do no matter what anyone had to say. In grade 12 after receiving an $8,000 scholarship, I decide to go away for university and this was just me breaking another stereotype. Conflict management, a better sense of identity and living a more active lifestyle is how sports helped me overcome the many barriers that came my way. I use this word a lot to describe my personality on and off the soccer field. 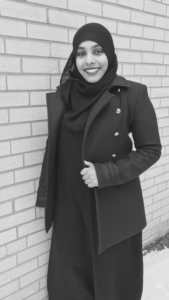 Being a small 5’1 Muslim girl in a one-piece hijab with long sleeves and track pants makes it very easy to spot me. Being the eldest of 2 siblings, I am determined to be a role model for them but also the community I grew up in. Teaching, volunteering and advocating for females in sport is very dear to my heart. A philosophy I truly believe in is that sometimes when you follow your dream, it opens the door for others to be able to follow theirs. Playing sports, staying true to my faith and making it a priority, along with working hard to achieve my own definition of success is what pushes me to strive and be better every day. First off, I would like to use a quote said by Ibtihaj Muhammad. She is the first Muslim American woman to wear a hijab while competing for the United States in the Olympics. This fierce fencer once said, “It’s important to me that youth everywhere, no matter their race, religion or gender, know that anything is possible with perseverance.” This quote is so universal and applicable in this day and age. Everyone should be given an equal chance but it also depends on how much they preserve individually. That’s what’s going to make the difference!